J. H. Schmerl, Subsets coded in elementary end extensions. 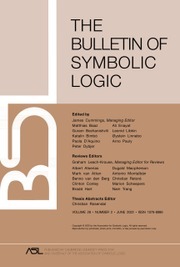 Archive for Mathematical Logic, vol. 53 (2014), no. 5–6, pp. 571–581. - J. H. Schmerl, Minimal elementary end extensions. Archive for Mathematical Logic, vol. 56 (2017), no. 5–6, pp. 541–553.